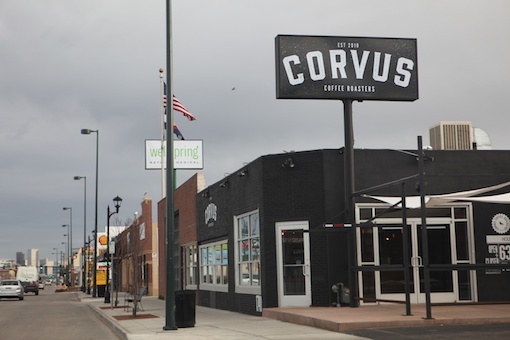 Corvus is one of the premier coffeehouses in Denver. While there have been numerous coffee places open in Denver over the past three years, many consider Corvus to be the best. We’re inclined to agree. Corvus has a very loyal following. And it’s well deserved. They recently were closed for what seemed like months, before moving to a new location just a few blocks up the street. Their new location is large and spacious. Facing South Broadway, there’s lots of glass which brightens the space. It also makes for a great way to watch the colorful characters that stroll up and down the street. There are a series of small tables and community tables, as well as a seat at the coffee bar. In nice weather, there’s a small outdoor patio on the side of the building. Corvus serves up their own coffee blends, from beans that are acquired from all over the world and roasted on site. You can view their roasting operation from the tables inside the coffeehouse. Corvus menu is short and sweet. Just six items. Cafe mocha’s feature Mast Brothers chocolate, which makes for an exceptional espresso drink. There is a small selection of pastries available and you can also buy freshly roasted beans at the counter. Corvus roasts on Mondays and Tuesday’s using a roaster made in the Netherlands. Service is quick and efficient. The baristas here pay exquisite attention to detail. Every drink, simple or complex, gets the attention it deserves. If there’s a line (which there usually is), be patient. You may have to wait a short while, but it will be worth it.